As we started planning for E3, the busiest week of the year, we decided that simply covering every PC game we could get our hands on at the convention wasn't enough. We wanted to do something ambitious. Something that would make our lives harder. Something like shooting the first episode of a new bi-weekly series about PC games. We're calling it The PC Gamer Show. This is Episode 0 of The PC Gamer Show. Consider it our pilot. Without the focal point of E3, future episodes will be different. Our goal is to showcase the kinds of things we do for our job every day: talking about and playing games, testing out new hardware, and interviewing developers. Every two weeks, we want to put out an episode a little bit funnier and a little bit more informative than the one before. 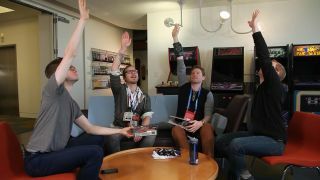 The PC Gamer Show is a new project for us, and we want your feedback to help make it better. What kind of segments do you want to see? What games should we play and talk about? Who should we have on as guests? What's coming up next?